Lady ferns have yellow-green to medium green fronds with feathery blade pairs. The upper blades are long-tapering and ascending. Plant spread slowly to form dense clumps. Under the right conditions lady ferns will continue to send up new fronds into the summer. 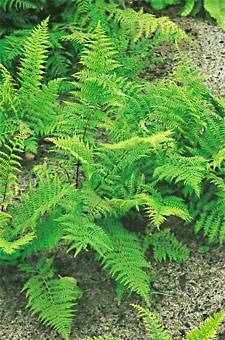 Lady ferns are one of the easiest ferns to grow. They prefer to be grown in part to full shade in average to rich, moist but well-drained soil that is neutral to slightly acid. Plants can be divided and transplanted in spring and early summer, planting the crown at the surface. Plant lady ferns in the woodland garden with hostas and other shade plants, or with large flowering plants and shrubs. Ferns prefer shade with indirect sunlight and high humidity.